Ina Mierig sent me this photo from Hamburg, Germany. 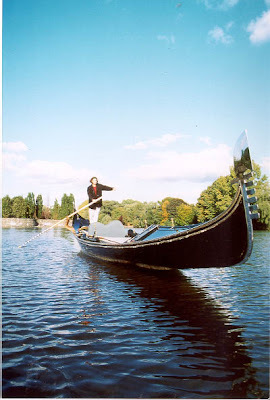 I've been holding onto it for a while now because I believe it might be the best 3/4 shot of a gondola I've seen. The water has perfect ripples and a great combination of blues. The light blue sky and horizon of trees add to things too. The trees and sky reflecting off the polished ferro are totally cool. But it's the angle of the shot - the way the bow is "coming at you" - that's my favorite part.